We are pleased to announce version 1.7 of SuperPWA! From the beginning we wanted to have a product that was intuitive and easy to use. We also strive to keep the product clean and as minimal as possible. At the same time, users send us a lot of feature requests (thank you!) and there is a lot we want to add to the plugin. The question was how we maintain a lean, clean product and still bring in complex functionality and new features. And the answer was add-ons. Very original, right? After all, one reason why WordPress is so successful is because of their plugin repository and that model has worked very well so far. Version 1.7 ships with our first Add-On UTM Tracking for SuperPWA. 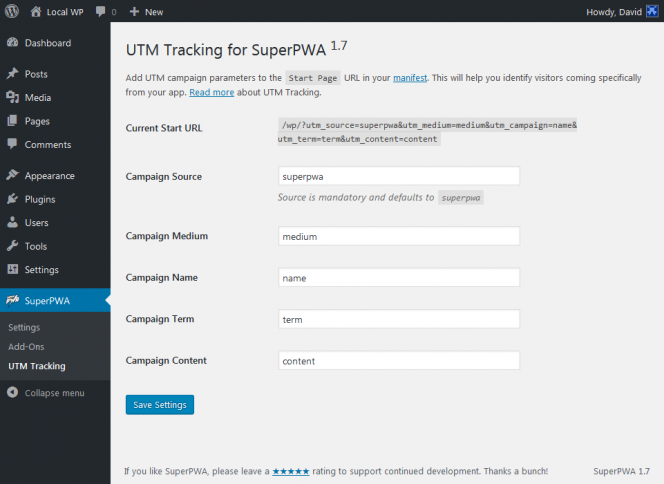 UTM Tracking add-on helps you add UTM campaign tracking parameters to the Start Page (start_url in the manifest) so that you can differentiate the visitors coming from your website and your PWA app. Imagine having all these settings added to the “Settings” page. A user who doesn’t have a clue as to what UTM tracking parameters are will find the plugin very complicated to use. In the long term, we want SuperPWA to be completely extendable. As a step in the right direction and for our own internal use, we have introduced these actions and filters. Details of each are available if you follow the link. Of course, more of these will follow in the future releases. Version 1.7 also takes care of some minor bug fixes and enhancements. The complete changelog is available here. Thanks for your continued support. Hope this goes without saying, we are always open to your feedback and suggestions. How do I use the first Add-on UTM Tracking? I activated it. Is it enough? Does campaign medium, name, term, content matter? Also, does turning this plugin on make any changes to the URL of the PWA app? I see there is a note called add UTM parameters to manifest file. Is that an additional step? I read the blog where it explains the add-on, but it is not detailed. Sorry, I am new to PWA and manifest. Please help. We will be updating the documentation soon, thanks to your feedback. Best regards.